With the 4th of July holiday weekend upon us, why not add a little red, white, and blue to the picnic menu? 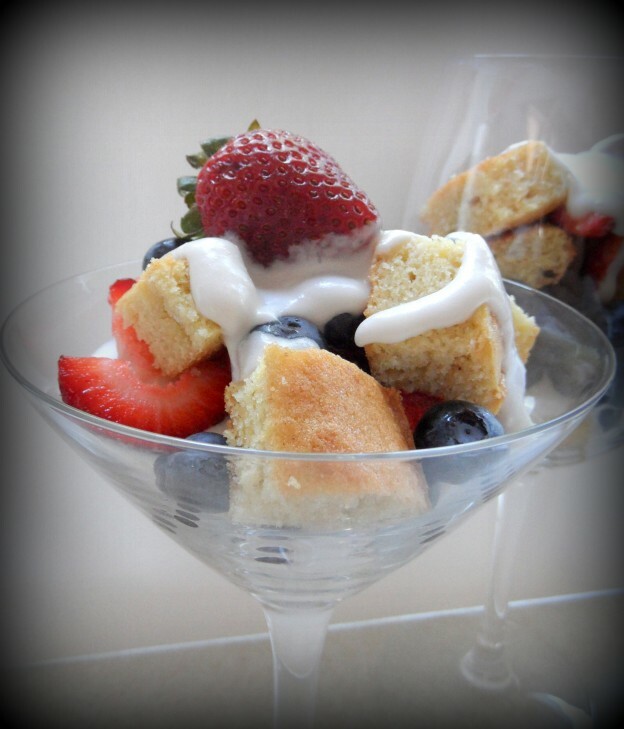 The combination of gluten and dairy free pound cake, fresh berries, and sweet coconut whipped cream make this a delicious and not too decadent dessert. You can arrange this in a large trifle dish, alternating layers of cake, fruit, and whipped cream. Or, serve in individual martini glasses for a fresh twist. Preheat oven to 350 degrees. Combine flour, xanthan gum, sea salt, and baking powder in a large bowl. In a separate bowl, add melted butter and slowly mix in sugar, orange juice, and vanilla extract. Add eggs one at a time, followed by the almond milk. Gradually add dry ingredients into wet ingredients, mixing well. Pour batter into two greased loaf pans. Bake for 50 minutes or until cakes are light brown and toothpick inserted into middle comes out clean. Let cake cool completely and then cut into small squares. It is best to use cold coconut milk, so open the can and place contents in the refrigerator. Drain off the coconut water. Scoop out the thick cream and begin to whip with your mixer. Gradually add in the powdered sugar and vanilla extract. Keep whipping until a cream forms. Assemble the dessert by placing a layer of cake, followed by blueberries, whipped coconut cream, and strawberries, repeating until dish is full. Can be made as individual desserts or in a large trifle dish.